Storytelling + Research = LoiS: Nocturnal Animals "Own the Night"
Nocturnal Animals "Own the Night"
The Collaborative Summer Library theme for the 2012 reading program is "Own the Night" and nocturnal animals are a natural connection for both libraries and naturalists. This summer I will tell tales of nocturnal animals found here in Michigan, but these stories come from all around the world. My mission in storytelling is to increase understanding through stories from around the world and back through time. Google gives these as "Top references for nocturnal animals" Owl, Bat, Raccoon, Skunk, Opossum, Cat, Hedgehog, Badger, and Firefly, but don't stop there! Other possible creatures include mouse, fox, wolf, coyote, moth, tree frog, cockroach, and I'd certainly add the Unofficial Michigan State Bird, the Mosquito! List of nocturnal animals -- This international listing upfront declares it's incomplete, but you can click on any animal for a Wikipedia article. Nocturnality -- Yet another Wikipedia article, this one shows why nocturnal creatures benefit from this adaptation. Homeschool Share on nocturnal animals -- This is both an overview and has a special featuring of owls and bats. Nocturnal Habits of Nighttime Animals -- Specific to Michigan, this looks at flying squirrels, whippoorwills, tree frogs, and great horned owls. So that's why those crows I saw made such a fuss! Franklin and His Night Friend -- Picture book favorite character, Franklin, makes friends with a bat. Story-Lovers S.O.S. -- Searching Out Stories lists books, online stories, and much more. Drop down to section 2 "Animals, Birds, Amphibians, Fish and Insects" and search by specific nocturnal animal. Enchanted Learning's coloring sheets of nocturnal animals from all over the world. Click on the creature, e.g., skunk, for facts and a coloring sheet. A to Z Teacher Stuff -- raccoon, crocodile, bat, and owl activities suitable for young children posted by Ms. Ann. 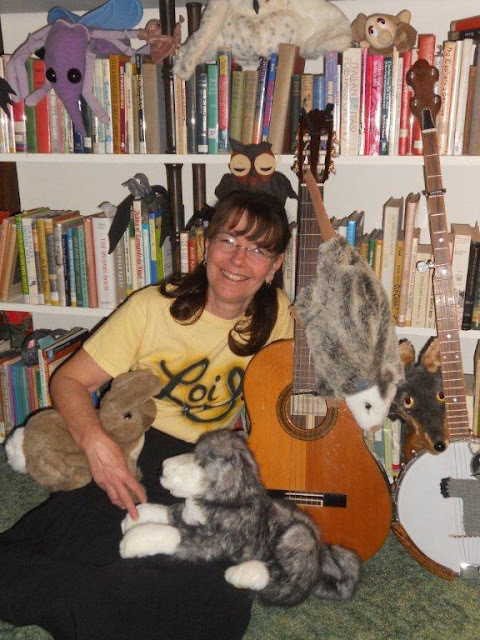 Children's Music by Nancy Stewart -- practical activity ideas and an easily adaptable song about nocturnal animals. Peter Weiss and his band, The Earth Rangers singing at Westlake Elementary School in Santa Cruz, CA (2007) a song about nocturnal animals. Sheppard Software Seek and Find Nocturnal Animals -- simple game for young children identifying hidden animals. Kids Planet - Who Am I? -- 20 different animal sounds to identify. Amsel, Sheri. 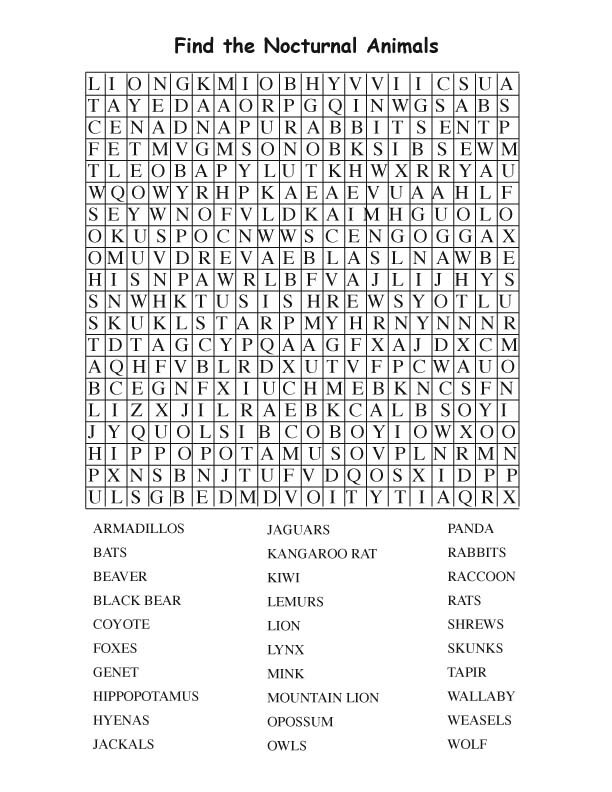 “Word Searches and Crossword Puzzles.” Nocturnal Animal Word Search (Older Readers). Exploring Nature Educational Resource. © 2005 - 2011. November 2, 2011. Teachers aren't the only ones who can use these ideas. Scan for good ideas to use also in libraries and nature centers. Isn't it wonderful when you can recycle your programs? Children's programs for preschoolers used 4 years ago can return and be used again with a whole new audience of preschoolers. In 2008 Who's Awake at Night? was the theme for the Michigan Reads program. The Michigan Reads pdf provides recommendations for books, crafts, music, games, fingerplays, and coloring sheets to help you plan your Summer Reading program to Own the Night..